Disney has been turning out successful live-action adaptations of classic fairy tales like 'Maleficent' and 'Cinderella' so it was prime material for parody on Saturday Night Live. 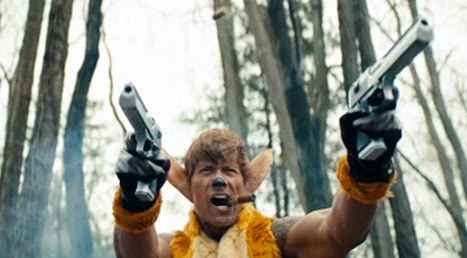 With host Dwayne "Franchise Viagra" Johnson playing Bambi, SNL imagines what a live-action remake of the cartoon would look like as a bloody revenge fantasy. The video short has all the makings of a typical Rated-R action movie trailer with slow motion guns blazing and catchphrases, "Deer crossing, motherf*ckers!" Bambi enlists the help of his woodland creature buddies that take on a familiar 'Furious 7' look as Vin Diesel (Taran Killam) plays Thumper, Michelle Rodriguez (Cecily Strong) plays Faline, and Tyrese Gibson (Jay Pharoah) plays Flower.